"The Hitler Historical Museum is a non-biased, non-profit museum devoted to the study and preservation of the world history related to Adolf Hitler and the National Socialist Party. True to its role as an educational museum, these exhibits allow for visitors to understand and examine historical documents and information for themselves. The museum, while acknowledging the tragedy that over 50 million people died during World War 2, retains its non-biased status by refraining from making political judgments of any sort. Neither does it make the standard, uninformative, and cliched historical judgement that the victor of the war was "good" and that the loser of the war was "bad." Instead, all materials and resources are provided as a documentation of the time period and as scholastic resources with notes for clarification. No biased judgments, slanderous labels or childish name calling exist here as they do in most of the writings on this topic"
The page 'Hitler's Art and National Socialist Era Art' ( http://www.hitler.org/art/ ) is a a song of praise of Hitler the brilliant artist. 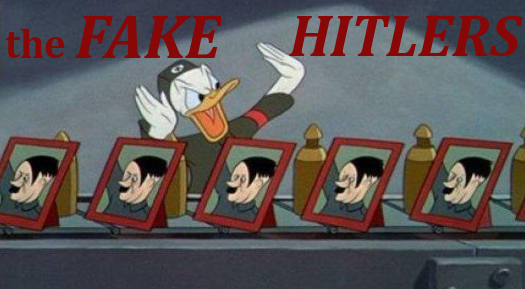 The information given there is nonsense and pure Nazi propaganda. 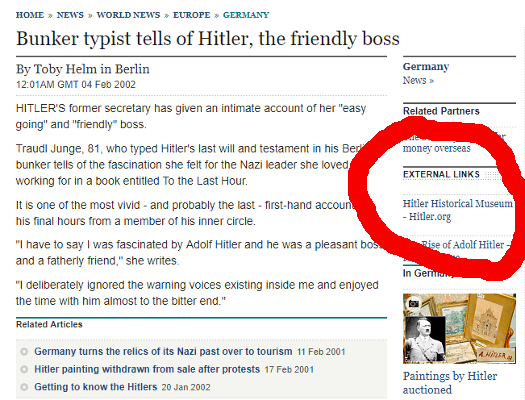 So how unbiased is www.hitler.org? Who is responsible for its content? On the site itself no information about its editors can be found. The Hitler Historical Museum site is registered behind the door at the right hand side of this building. "(...) United . Thought had an earlier address in Herndon, Virginia – an address that turns out to be a postal box at a store in a strip mall. We also learn that this same organization owns several domains that are devoted to Nazism and current National socialist politics, including siegheil.org and nazi.org. The latter website is the home of the Libertarian Nationalist Socialist Green Party (a Neo-Nazi organization). This educated poking around online resulted in a picture of the Hitler Historical Museum as part of a network of websites devoted to current neo-Nazi politics in North America, and owned by a person or an organization in San Francisco. 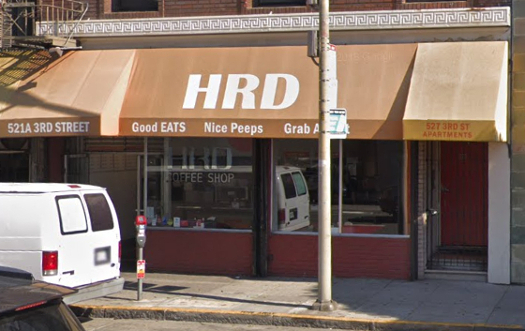 Finding out more about the site’s owner would require, among other things, traveling to San Francisco or hiring a private investigator – both clearly beyond the pale of any basic literacy lesson. But simply knowing the owner(s) of the Hitler.org website also own a series of neo-Nazi websites calls into question the website’s claim to be unbiased in its presentation of information about Hitler and his career." In: T. Mills Kelly. Teaching History in the Digital Age. University of Michigan Press, Ann Arbor, 2013, page 39-42. Grey propaganda is basically information that sounds reliable, but isn't. The receiver of this information is deceived by the sender about its origin. In this case the sender, a Neo-Nazi person or group, tries to influence how people think about Hitler. In this the 'Hitler Historical Museum' is quite effective, as several American and British newspaper and magazine journalists have used the information from this site in their articles, and even refer to this site - ignorant of its true nature. Stanley B. Cunningham. The Idea of Propaganda. A Reconstruction. Praeger. Westport, Connecticut, 2002. Lee Richards. The Black Art. British Clandestine Psychological Warfare against the Third Reich. Psywar, Peacehaven, East Sussex, UK. 2010. Both (partially) on Google Books. Sarah Left. A neo-nazi 'angel of death'. The Guardian, London, 22-03-2005. Randall Bytwerk. Do Historians Have a Responsibility to Warn the Public About Misleading Websites? History News Network, Columbian College of Arts & sciences. The George Washington University, Seattle, April 7, 2006. The BNP and US Eco Fascists. Raincoat Optimism, 19-04-2010. Rick Wyatt. 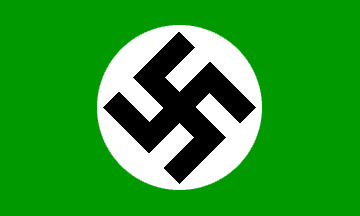 Libertarian National Socialist Green party (U.S.). LNSGP. Flags of the World Web Site, 25-04-2015.